The four MK111 pumps in the Supa-Stelth range. One of India's largest solar pump and power drive manufacturers, Rotomag Powerdrives India, has recently signed an agreement with Brisbane-based New Fluid Technology (NFT) which guarantees the use of its SUPA-STELTH solar pump technology in Rotomag’s future generation of solar agriculture pumps. Rotomag evaluated the Supa-Stelth pumps and their related technology at its Vadodara labs in May and concluded that use of the pumps would mean they could cut the number of solar panels needed for projects by one third. It believes that this cost reduction could also be shared with the Indian government, which heavily subsidises solar pump installations for the Indian farming community. NFT has been developing the Supa-Stelth pumps for more than ten years and has improved and replaced the wet-ends. 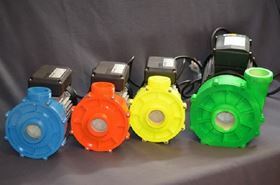 The company says that motors used are standard and it is a simple internal geometric shape change that makes the wet-ends of the pumps more energy efficient. The water is introduced via an improved impeller which, due to the internal geometry of the pump, then becomes a solid wheel of water, which exceeds the diameter of the impeller creating higher pressures and efficiencies. This is called a solid body vortex. NFT has also added a large diameter drum (spigot) integral to the impeller which attaches the solid body water vortex to the impeller which spins the water. The Supa-Stelth pump develops its pressure by centrifugal force at the solid body vortex periphery inside the casing wall. In effect the water wheel replaces the impeller. The company says that the result is a higher efficiency than conventional centrifugal water pumps because the water undergoes less momentum and direction changes than with conventional water pumps. The savings mean that the amount of water pumped on a litres p/hour of sunlight basis could be increased by around 30%. NFT says that by incorporating the Supa-Stelth pumping technology Rotomag can more economically supply the 75 million Indian rural households who are off grid.